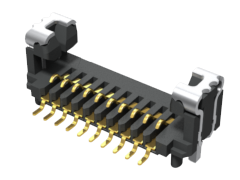 This FireFly™ positive latching receptacle is one part of a two-piece connector system with a tiny footprint on the board and interchageable for both copper and optical flyover cable assemblies. The receptacle is designed to secure the flyover cable assembly to the board with weld tabs that significantly increase the sheer resistance of the connector to the PCB. It not only provides rugged mechanical support but also optional power and low speed communications. Click here to see a full list of mates related to UCC8. We're having trouble loading our UCC8 3D Models. Please refresh the page to try again. If you continue to experience issues please contact ehelpdesk@samtec.com for assistance. We're having trouble loading our UCC8 Models. Please refresh the page to try again. If you continue to experience issues please contact ehelpdesk@samtec.com for assistance. We're having trouble loading our UCC8 SI Performance data. Please refresh the page to try again. If you continue to experience issues please contact ehelpdesk@samtec.com for assistance. We're having trouble loading our UCC8 SIBoard. Please refresh the page to try again. If you continue to experience issues please contact ehelpdesk@samtec.com for assistance. We're having trouble loading our UCC8 Protocols. Please refresh the page to try again. If you continue to experience issues please contact ehelpdesk@samtec.com for assistance. We're having trouble loading our UCC8 Catalog Pages. Please refresh the page to try again. If you continue to experience issues please contact ehelpdesk@samtec.com for assistance. We're having trouble loading our UCC8 Prints & Footprints. Please refresh the page to try again. If you continue to experience issues please contact ehelpdesk@samtec.com for assistance. We're having trouble loading our UCC8 Series & Mates. Please refresh the page to try again. If you continue to experience issues please contact ehelpdesk@samtec.com for assistance. We're having trouble loading our UCC8 Test Reports. Please refresh the page to try again. If you continue to experience issues please contact ehelpdesk@samtec.com for assistance. We're having trouble loading our UCC8 Technical Library. Please refresh the page to try again. If you continue to experience issues please contact ehelpdesk@samtec.com for assistance. We're having trouble loading our UCC8 Compliance & Quality. Please refresh the page to try again. If you continue to experience issues please contact ehelpdesk@samtec.com for assistance. We're having trouble loading our UCC8 Product Tools. Please refresh the page to try again. If you continue to experience issues please contact ehelpdesk@samtec.com for assistance.